The university is using an all-hands-on-deck approach to address the crisis in a collaborative effort with local government and community organizations. Share of homeless who are unsheltered – such as sleeping on benches or in tents – in L.A. County. It’s the highest unsheltered rate in the country. This week, USC students are popping tents across campus to spread the word about homelessness. Homelessness Awareness Week – a collaborative effort between university staff, faculty, local government and community organizations – marks the largest and most comprehensive push the university has made to tackle the issue. Homelessness is a top priority to Provost Michael Quick, the chief academic officer of the university. “This is exactly the kind of effort we must take on,” Quick said Monday. Right now, Los Angeles’ homeless population symbolizes not only a statewide struggle, but also an issue of national proportions. Twenty-one percent of the nation’s homeless call California home, according to the county. 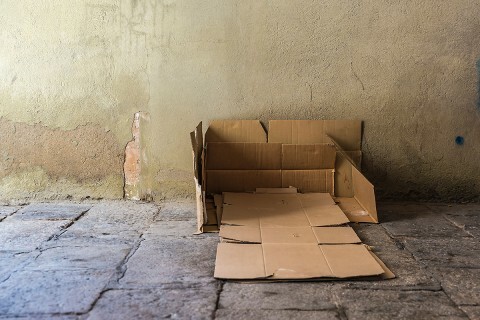 While homelessness was stable for a while, it has seen an overall increase in the last two years. 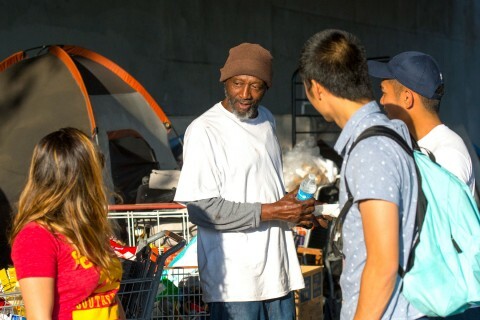 “I’m hoping we can make a big dent in homelessness in the next year,” said Dhakshike Wickrema, deputy for homelessness and mental health for Los Angeles County Supervisor Mark Ridley-Thomas, whose district includes the USC University Park Campus. The camp will be at Pardee Plaza on Oct. 25-26, the Religious Center on Oct. 27 and Tommy Trojan on Oct. 28. Go there to sign up to volunteer, get information on the city’s homeless count or to register to walk Skid Row on Oct. 27. Visions and Voices event Oct. 25. 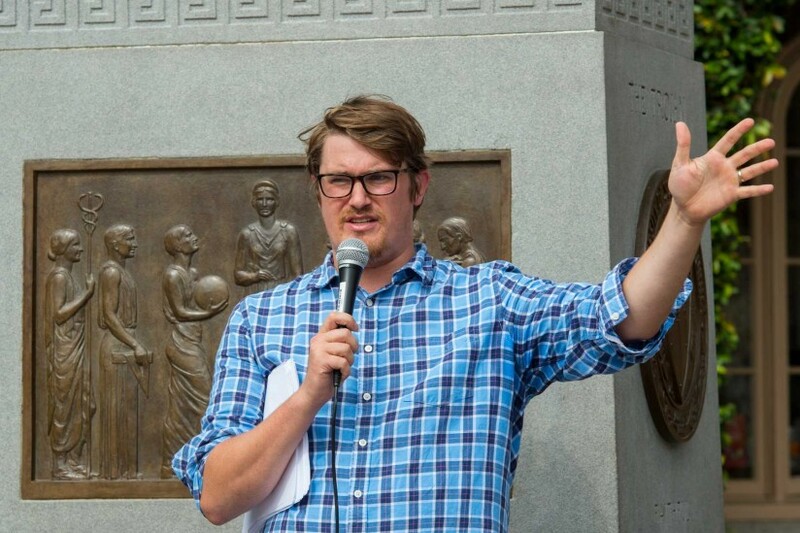 O’Connell founded the Boston Health Care for the Homeless Program, the first in the country to develop electronic medical records for the homeless. He’s worked with people living on the streets for 30 years and authored Stories from the Shadows: Reflections of a Street Doctor and edited The Health Care of Homeless Persons. Admission is free but RSVP is required. The calendar of events is available on the Homelessness Awareness Week USC Facebook page and more information is available on Twitter at @homelessnessUSC. This week is symbolic of an all-hands-on-deck approach the university has taken on the issue. This year, Quick announced that homelessness was one of the top four “wicked problems” the university would put resources to solve. The university aims to bring faculty from across disciplines – from architecture to engineering – to come up with solutions, collaborating at the city and county level. The week of activities is predominantly student led, where they’ll be passing out information to fellow students on how to help and also leading walking tours of Skid Row later in the week. Quick is also using the week to kick off his wicked problem speaker series with a conversation with James O’Connell, a Boston doctor who worked with the homeless for 30 years. 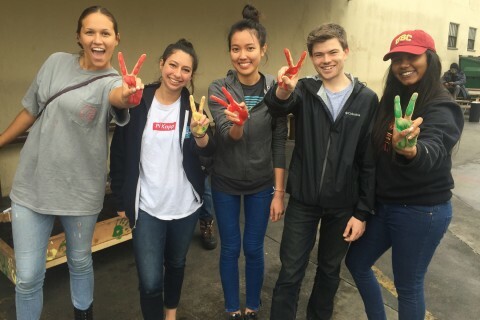 Besides students, the USC Suzanne Dworak-Peck School of Social Work is also leading a national push, along with New York University, to get social work schools across the nation to prioritize homelessness. 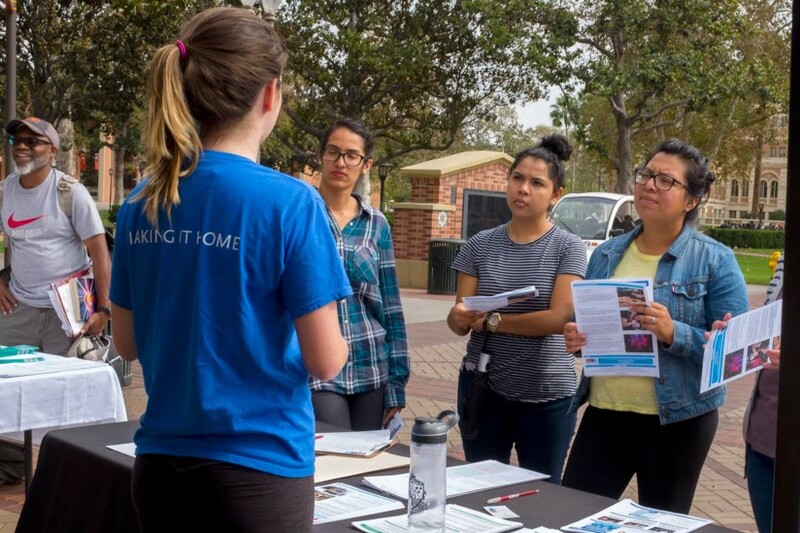 Professor Ben Henwood, who is steering that effort, called on Trojans on Monday to not just push to end homelessness but to let them know L.A. is their home too. “The harder part is helping people who are part of our community feel like they belong here,” he said. Meg Barclay will keep her eye on the big picture while bringing together partners from private and nonprofit sectors. 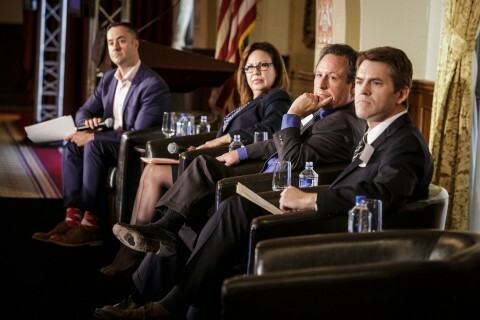 From housing and supportive services to business and technology solutions, panelists outline framework for tackling one of society’s most intractable problems. Trojans teach computer skills, build urban gardens and establish job-training programs.